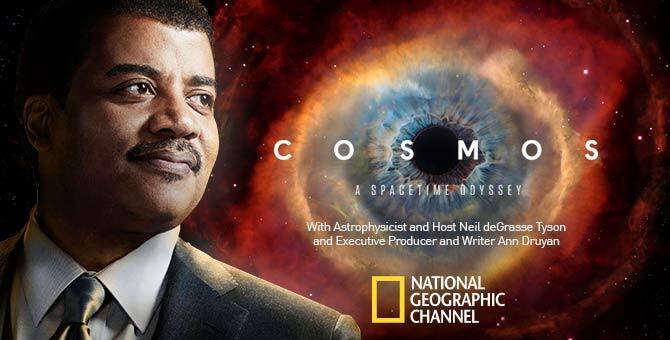 You must be living under a rock if you haven’t heard about or seen the first two episodes of the reboot to Carl Sagan’s Cosmos: A Personal Voyage (originally aired on PBS in 1980), Neil deGrasse Tyson’s Cosmos: A Spacetime Odyssey (on FOX and National Geographic networks). While all of it so far has been a treat to watch and Tyson is charming in his enthusiasm for science, the first episode (FOX/Hulu) came under fire largely by historians for its cartoon depiction of how Giordano Bruno was burned at the stake by the Roman Inquisition in 1600 for his cosmological views (painting him a martyr for science and perpetuating the long-discredited “conflict thesis”). If you wish to dive into this discussion, see these posts: 1, 2, 3, and 4). Luckily the second episode, all about evolution, steered clear of myth-making in the history of science and presented a solid treatment of evolution (thoughts from PZ Myers, Larry Moran, and Steven Newton/NCSE about the episode). You can view episode 2 of Cosmos, “Some of the Things Molecules Do,” through FOX or Hulu. Enjoy! This entry was posted in astronomy, documentaries, evolution, history of science by darwinsbulldog. Bookmark the permalink. Don’t you know that Cosmos is of the devil? Neil DeGrasse Tyson is an agent of Satan, an arrogant, evil man who thinks it is possible for a mere human to destroy planets like Pluto. Only God can make and destroy planets, and in the end times, God will destroy all the evil men on this planet. Neil DeGrasse Tyson is one of these evil men. Tyson is clearly of the devil. First off, he’s an astrophysicist that worships Carl Sagan. That means he most likely smokes a lot of marijuana. Second, he’s an ungodly atheist that doesn’t know Jesus. How uncool is THAT?! The Kingdom of Heaven is a wonderful place, but the unsaved are unwelcome. Neil DeGrasse Tyson wants to make you and your children unsaved! He seeks to lead us all away from Jesus! Please kindly refrain from publicizing the godless ungodly drivel of Cosmos unless you are giving equal time to Biblical truth. We wouldn’t want our children to believe that the scientists’ theories about the universe are fact; they are, after all, just theories. Cosmos is Satan’s favorite TV series, and all who are led away from God by it will burn in Hell. Please don’t burn in Hell! Reject Cosmos and reject Neil DeGrasse Tyson, that agent of Satan! This episode also unfortunately presents evolution as a scientific fact, which it most certainly is not. Evolution is nothing more than a myth created purely out of circumstantial evidence – huge masses of circumstantial evidence as evolutionist Richard Dawkins asserts, true, but circumstantial nonetheless. No single experiment using the scientific method has ever proven evolution. The fact that it is even regarded as scientific by some is amazing, and the fact that it is presented in Cosmos as undoubtedly true is frankly an embarrassment to the series as a whole. Firus, please indicate how you know that “Evolution is nothing more than a myth” – is this inspired by some sort of religious diktat? And please describe the sort of experiment that would convince you of the reality of evolution – perhaps such an experiment has already been accomplished but you have not had a chance to review the literature. Just as scientists continue to debate the nature and cause of gravity, it is still understood through observation (of falling bodies and gravity waves, for example) and there is no definitive “experiment” that proves gravity exists. For gravity, there are just observations of its effects – which some might call circumstantial evidence of its existence. The Law of Gravity is labeled a “law” due to the fact that its effects can be demonstrated time and time again using the scientific method. However, the theory of evolution (which mainly is associated with macroevolution) has not yet been repeatedly proven via the scientific method; therefore it is a “theory” and not yet a “fact” or “law” as stated in this particular television series. However, I must say that microevolution can be demonstrated using the scientific method; therefore, evolution is certainly not a myth either as stated by Firus. So please, if you are going to unleash your opinions on the World Wide Web, please first research the topic you are writing about. Similarly, with respect to “macroevolution,” the observations of its effects make up the bulk of its deposition. Nevertheless, the scientific evidence is clear – and even testable. As one example, the fact that humans have 23 chromosomes while the other apes have 24 was once viewed by anti-evolutionists as proof of lack of relatedness. Thirty years ago, evolutionary biologists countered that argument by hypothesizing that one of the chromosomes in humans may be the result of a fusion of two antecedent chromosomes. It was not until 2005 that this was proven as fact – human chromosome 2 (our second-longest chromosome) was discovered to be homologous with a fusion of two primate chromosomes. Other similar testable, falsifiable hypotheses regarding existence of “missing link” fossils have also benefited from the scientific method of hypothesis and hypothesis validation when those fossils were finally uncovered. Thank you again for your interesting comments. They certainly give readers of these pages an opportunity to think about the difference between laws, theories, and creationist obstreperousness. Miksha, don’t you see? The chromosome example you gave is *still* just circumstantial evidence. No matter how homologous they are, you cannot prove the fusion of two primate chromosomes resulted in humans. Until you can, evolution is still just a fairy tale, not a fact.